It’s full of good advice for the aspiring author; I highly recommend it. It got me to thinking–is there anything someone can do to improve their chances with an agency, or agent? So, here we go–my suggestions! 1) Only send your work to the right people. A friend of mine Toronto runs a very successful literary agency. It says all over the website—“NON-FICTION ONLY.” And yet he still receives 2-3 novels a week. Don’t be one of those people. 2) Try to follow the submission guidelines to the letter. I know this is annoying; everyone has different rules; but those rules are there for a reason. 3) Patience. I know, this is annoying too. But please allow 8 weeks before asking for a response. I know, I know, this is a living death. But you would be astonished by how many submissions agents get, even agents who are are not famous or listed in directories. 4) Be prepared to take no for an answer, even some criticism on your proposal. Criticism is a gift, even if it doesn’t look like it or feel like it. I know this can be tough to take. But I am serious. If you submit to agent A, & she says no & says why, & you take her suggestions & amend your proposal, your chances with agents B or C are much improved. 5) DON’T be a whiner. Agents have to say no more often than they would like to. 6) If in doubt, send the shorter form. By this I mean, for submissions, less can sometimes be more. Say you are considering which chapter to send as your sample. One is 25k words long, the other, 15k. Unless the 25k chapter is sparkling, prizewinning, & un-put-down-able, send the chapter that is 15k. 9) Spell my name right. Spell your name right. Double, triple check your work. I throw away stuff addressed to Brain Woods. Just got back from Edmonton, from the Get Publishing conference held every two years. Met a lot of great new people. The conference organizers asked me to be part of “Pitch Camp,” where authors can come to see editors, agents, publicists, publishers, etc, etc, for some one-on-one contact. Six people came to see me over the course of two hours. All of them had some great ideas–& I wish them well. In many respects, this is what book publishing has been reduced to: publishers are making less & less, so they are taking fewer & fewer chances. In April I had a publisher in Toronto, a good one, tell me he was uninterested in any book that would not sell at least 10k copies. So where does this leave the first time author? Good question. It’s one thing for a new author with a national tv, print or radio forum. They can always find a publisher willing to take a chance with their stuff, esp. for non-fiction. I tell new authors they should think about hiring a publicist. 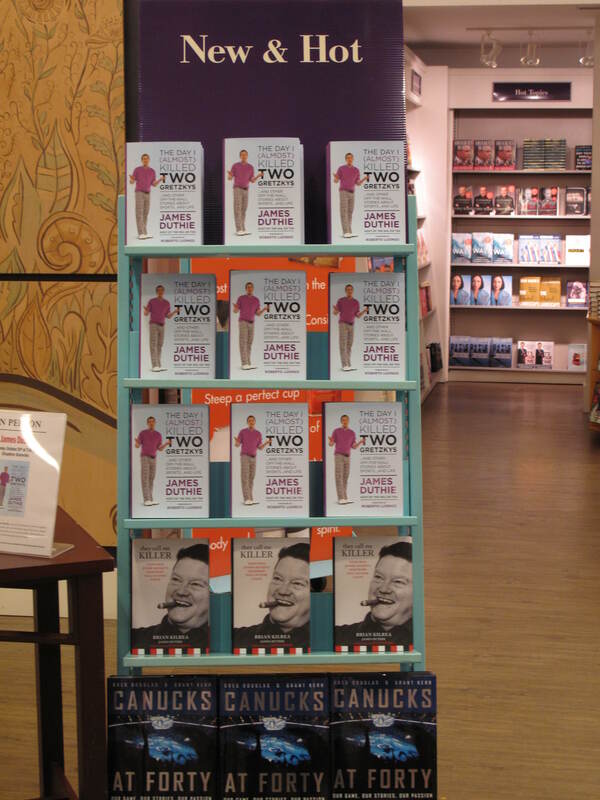 (Two great ones in western Canada are gal friday in Vancouver & the publicity mavens in Nanaimo.) There are no guarantees; but publicists can get you the media’s ear in ways no one else can; & this could lead to the kind of regular exposure that publishers are interested in. The other thing to do is attend events like Get Publishing. I learned more talking to the G.M. of NeWest Publishing than I would have in months & months of reading the website. We can have all the fancy e-availability we want; but nothing will ever replace the face-to-face meeting; not texting; not teleconferencing; not skype. To all the people who came to see me at Pitch Camp–thanks, & best of luck! This has turned out to be true. I am, proudly, based in Vancouver. But of my 22 sales, only 6 have been in B.C. The other 16 have been sold to Toronto-area publishers; & this would not have been possible without these trips. It’s amazing, in this this era of cell phones, texting, emails, conf calls, & so on….how much personal contact means. Because if you sign up to attend, you’ll hear great speeches by the keynote speakers….but to me THE great opportunity for writers is the pitch camp. Because you get a chance to actually meet people in the industry. Publishers, editors, managing editors, agents, publicists….you name it. It’s one thing to check out a publisher’s website. It’s quite another to meet someone who actually works there. I’ll be at Pitch Camp….come & say hi if you get a chance! What is a Chapter outline and why do I need it? Yes, I know I should post more, but really, who has the time? I’m too busy betting on ridiculous things with my brother and girlfriend, (even though I know I’ll lose- case in point it wasn’t Jodie Foster in Single White Female- it was Bridget Fonda- oops) that blogging is the last thing I’ve been thinking of. But seriously, I want to talk about Chapter Outlines for a minute. Many authors know they need to have one to show to an agent but they don’t know why. Well, I’ll tell you. I can tell from a chapter outline immediately if I want to represent your work. It gives me an instant look at how clear your writing is, what your book is about and whether you have the organizational skills to complete your book to the level that I can sell it. In many cases I really don’t need your sample chapters. I can tell by your outline. And if you don’t submit a good one, then I’m going to say no. Simple as that. As well, if you have typos in your email to me, I usually say no. Your introductory email is your elevator speech. I scan the page in 60 seconds and if I find typos or poor grammar, I don’t give you the time of day. Why am I so strict? Probably because I haven’t had my scotch yet, or that I’m tired of people telling me all about their fantastic book that their friends and family liked so they don’t need a professional editor. 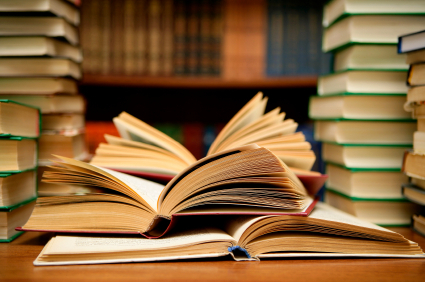 These days, books have to be in pristine shape to sell to a publisher, because there are fewer editors available to work on your book once you get a deal. If they have to worry about dozens of typos- they aren’t going to buy your book. So what do you put in a Chapter Outline? Well different agents request different styles. Some like a full chapter synopsis and others want to see an outline that maps out certain areas. Below is one example of how you can structure an outline. Chad Viminitz, author of the Money Assassins published by Insomniac Press, kindly let us use his work as an example. This book was sold to Insomniac by my associate Rachel Sentes, and I negotiated the deal. This is what a Chapter Synopsis looks like, but also gives us an idea about how the book is going to be set up. This chapter explores the impact that the Great Depression and World War 2 had individuals’ financial perspectives and beliefs and how today’s society has forgotten many of the valuable financial lessons from this time period. The Depression has said to have one long lasting therapeutic effect, it lingered in the financial memory of those who survived, it made individuals question their relationship and values surrounding money. This introspection is missing today. This chapter discusses the importance of financial empathy, the value of a common purpose and shows how government played a supportive role in encouraging savings in the past and why it is needed again but will not happen. Chapter two forces individuals to question what wealth and happiness really means to them. It discusses why money does not buy happiness through the concept of relativism, the idea of financial “waste” and challenges the traditional measurement of economic progress, GDP. This chapter helps readers to understand that financial well-being is not a number but rather a mind set. The First Assassin, technology, is introduced and how it has changed and influenced payment methods and exposes the true financial cost of Debit Cards and Credit Cards. Never being without the ability to pay, bypassing ones financial conscience, has led many individuals to spending beyond their means. Sending the Money Assassins after adults is one thing, sending them after our children is a whole other story. Child marketing and its effects on personal finances is an essential but missing piece of the puzzle in solving, “why we spend more than we make?” With children nagging and influencing hundreds of billions of dollars a year, individuals need to be aware of the changing role marketer’s play in our children’s lives. Groomed to Consume examines the methods that are used to get children to spend their own money and influence parent spending ranging from groceries, vehicle purchases and family holidays. This chapter also raises concern about the future financial mindset of generations who have been told to consume, spend, and go into debt. The social pressure to spend and consume is considerable. Applying this pressure has been both the marketing and advertising industries. They have woven themselves into the daily fabric of our lives and have gone through a transformational role since the 1970s. Consumptive communities and undercover marketing are just two ideas, which exemplify the social pressure to spend and its harmful effect personal finance. The consumer society’s unspoken motivator has been fear. Fear of being social excluded if one does not participate. So individuals spend and have been spending more and more on life’s so called “new necessities.” The base line standard for consumption has been quietly raised and the distinction between want and need has been blurred. Few people are aware of the cumulative costs of owning and operating a vehicle and the potential adverse effects on their financial well-being. The chapter breaks down the full cost of vehicle ownership and outlines the financial benefits of reducing ones vehicle expense from 20%, of total income, to 10%. The chapter addresses the challenges of reducing ones reliance on private transportation and gives suggestions on how to make the transition easier, through such concepts like location efficiency. It is through adopting a “car lite” lifestyle that readers will learn they can find extra money to commit to other financial goals such as early retirement. The decision to buy a home is the single greatest determinant of the long-term financial fate of individuals and families, yet 80% of first time homebuyers never seek financial advice. This chapter will address some basic guidelines, with a focus on first time homebuyers, home up-graders, and those who seek to free up cash flow and reduce debt. It will also explore strategies to avoid becoming “house rich” and “cash poor,” to save effectively for a down payment, and to determine the mortgage payment that their financial plan can withstand, through calculating ones Total Debt Service Ratio. Caution about using the Home Buyers Plan to fund ones down payment is also discussed. The last core chapter highlights pearls of financial wisdom. The first being how much of ones gross income should one save. Explaining it should be between 20-30% of ones gross income. The “Heart Attack Graph” is used to help the reader understand their financial plans allocation. One of the most important concepts in the entire book is the “investor-saver confusion,” and in detail, clarity is achieved. Every financial plan requires both an offense and a defense. Most financial books skip the defense but here we explore the misunderstood world of financial protection and personal insurance. I can tell a great deal about is writing, how the book is going to come together from this kind of submission. And it also shows me that he’s willing to take the time to put down his thoughts in a cohesive and complete manner. Here is another example of an Outline that I often show people- Now I found this someplace but I have NO idea who originally put this together. So if you did, then by all means I want to give you credit for it! So drop me an email!! Introduction – Map out what the reason for this book is. Why you wrote it, What you’ll find in the book and any other important reasons for reading it. Chapter 1 – Writing as a Career? Chapter 6 – Are You Ready? So you see, if you put the effort into it, you can go a long way when submitting to an agent. And trust me, we appreciate the dedication to your craft. It’s not all about the book. It’s about how you sell the book. Ah Christmas. Where is that book when you want it? Christmas for an agent is a bittersweet time. On the one hand, there are more Toblerone’s in the stores to eat, but on the other hand publishing accountants go on vacation and there are no cheques arriving to buy said chocolate. It can be a tough time for agents during the holiday season. Even more frustrating are the dozens of complaints you get from your clients because the books aren’t on the shelves. I’m fortunate in that I have a lot of very good people in the bookselling industry who can occasionally help me out when it comes to merchandising. But even with their help it can be very difficult for authors to get their books replenished at Christmas. Warehouses get full and behind and some stores are so focused on selling gifts, they forget about the books that are supposed to be out there. There is nothing worse than having an author go on television to promote their book and finding out there isn’t any place to buy it. Oh sure, they can go online and get it, but even with all the download options out there, people still like to go down to a bookstore and browse through it in their hands. So, let me make it easier for you. If you are searching for that elusive gift this Christmas ( say James Duthie or Bob McKenzie), and you can’t find it. Give my associate Rachel a call or email and we’ll see if we can get you a copy directly. We may ( and I say may) even be able to get you a signed copy. Again, a little scotch in my Christmas stocking may help you with your shopping! Well, it’s almost the end of October so I guess I need to blog again. People keep telling me to get onto the social media bandwagon, but I really hate it. People are lucky if I turn my cell phone. I love email and I love using the phone but that’s about it. I admit, that there have been moments when my cell phone has been of great use to me, but I don’t want to be that ‘guy’ on the skytrain that tells the person on the phone “I’m on the skytrain.” Sadly, that’s already happened to me, but I’ll get over it. I don’t know if the people on the train will. 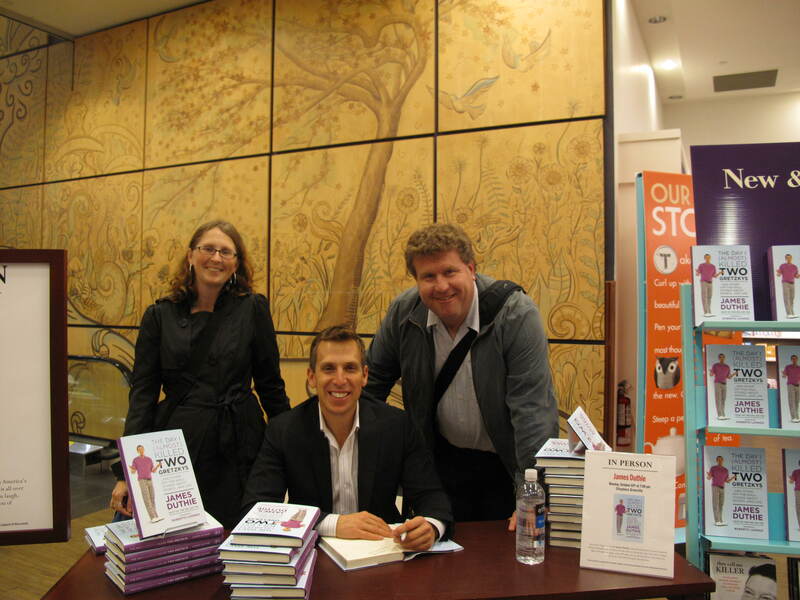 The other night I had the pleasure of meeting up with one of my great clients, James Duthie, Author of The Day I Almost Killed Two Gretzkys. 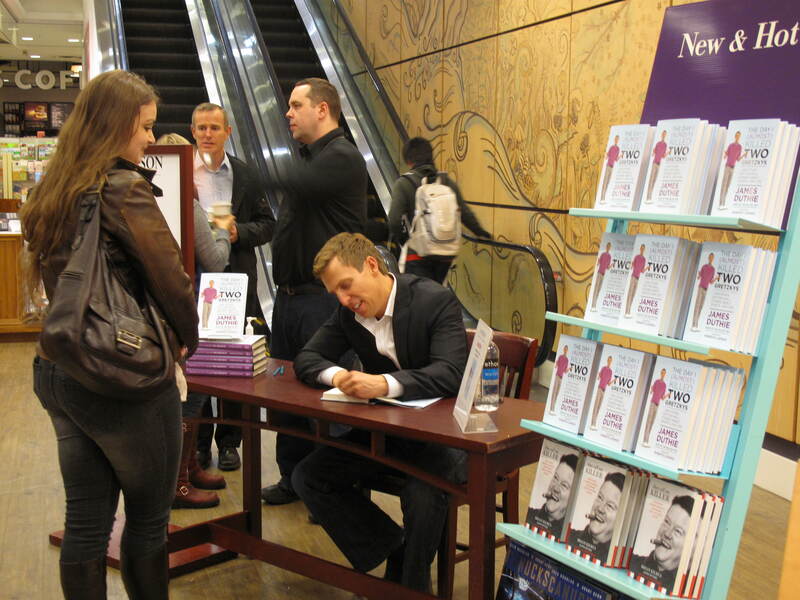 He was signing books down at the Chapters on Broadway. It was great to see the displays and meet some of his fans. Of course this is a great time to pick one up for Christmas! Well, it’s that time of year again, the pilgrimage to Toronto-the land of broken dreams and hard to reach publishers. About twice a year I like to go and meet face to face with the publishers that I sell my books to, and set up meetings with prospective new clients. I also like to remind them all that there are amazing authors outside of the GTA. It’s odd, but after all these years there still seems to be an invisable force field around Toronto that some editors refuse to look past when it comes to buying manuscripts from Western Canadian writers. Some of the strongest writers in Canada are out here just waiting to be discovered, but don’t get a chance because Toronto doesn’t know who they are. But that’s why I encourage so many writers to consider putting together a publicity platform before they start sending their work out to editors and agents. If Toronto knows who you are, there is a greater chance they will buy your book. Because in the end it’s really not the editors who are making decisions, it’s the sales people. You have to convince the sales people that you can market and sell your book, because they are the ones that hold the purse strings. An editor can love your work, but if they can’t convince the sales people that they are going to make money, then forget it ( and a good scotch might not help). Of course, some will just say “go to the U.S ,” there are plenty of publishers there who will take your book. Indeed, I know a few writers who have managed 3 book deals for fiction and can’t wait for their books to come out. Of course, most of those people have been writing for years and have an impressive writing resume. New novelists and writers, the ones that show up with blockbusters are one in a million. I’m not saying that you aren’t that one, but you also have to live in reality. That’s where I live. Actually I live in an apartment waiting for royalty checks to arrive. But that’s another story. If you think you are going to make any money as a writer, think again. Think about publishing your book, doing a great amount of publicity, seeing some sales, and then getting paid maybe ( if you are lucky), a year later. And don’t forget, while you are waiting- so is your agent. Your agent doesn’t get paid until you do. I sold two best sellers last year and I’m still waiting to see a dime from them. Yes, that’s right. Don’t expect anything for a really long time. So if you are into writing your book for money- do it online and focus your marketing that way, because retail sales are going to take a long time to show up. Anyway, enough on the soapbox. I’m looking forward to visiting family, friends, and business partners in good old Toronto. And I hope to do some deals. I love that part of my job.That, and the fact that FOOTBALL is back on. In the meantime, check out my submission guidelines ( Don’t submit through here- I hardly ever check my comments) and I look forward to discovering the next great best seller. Oh and check out my associate Rachel Sentes and her site www.gal-fridaypublicity.com. She’s one of those people that can help you with your platform.